The Canon EOS 1000D was launched in 10th June 2008 (also known as EOS Kiss F in Japan and the EOS Rebel XS in the rest of the world) – this entry level DSLR was designed and meant to cover the market meant for beginners with their “first DSLR” and those switching from compacts to DSLRs. Manufactured & marketed as the cheapest Canon DSLR money can buy, the EOS 1000D captured the market by surprise with its asking price and built quality. So after 34 months, we get an update. April 2011, Canon surprised the world again. The Canon EOS 1100D (EOS Kiss X50 in Japan and the EOS Rebel T3 in the rest of the world) was launched with even more surprise! The higher spec-ed EOS 1100D now comes in Maroon Red, Gun Metal Silver, Outdoor Brown & Classic Black. I was lucky to get the Gun Metal Silver for a review from the local guys. So what has changed? I shall not state all the technical specs here which might bored you out. Instead, I shall highlight its important changes here. For the full specs, google for yourself. EOS1000D: Digic III/ 10.1mp/ 7 AF Points/ LCD 2.5″/ ISO100-1600/ LP-E5 Battery/ EFS18-55mm F3.5-5.6 IS. 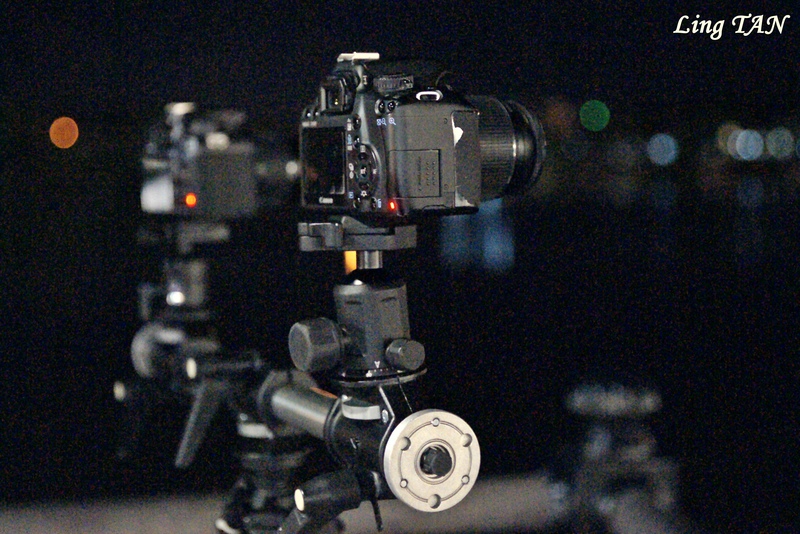 EOS1100D: Digic IV/ 12.1mp/ 9 AF Points/ LCD 2.7″/ ISO100-6400/ LP-E10 Battery/ EFS18-55mm F3.5-5.6 IS II. Test 1: Mountain Path at Kuching, Sarawak, East Malaysia with lights from setting sun & partial shade. Both cameras set to 1/100, F6.3, ISO 200, FR 18mm, Evaluative Metering, AWB, Spot Focus on Centre AF, Manual Exposure. Test 2: View from the Mountain at Kuching, Sarawak, East Malaysia with lights from setting sun & slight haze. Both cameras set to 1/100, F6.3, ISO 400, FR 55mm, Evaluative Metering, AWB, Spot Focus on Centre AF, Manual Exposure. This is one tricky scene for the camera. Light is getting dimmer by the minute when I was setting up for this scene. Using the previous setting, I decided to boost up the ISO to 400. 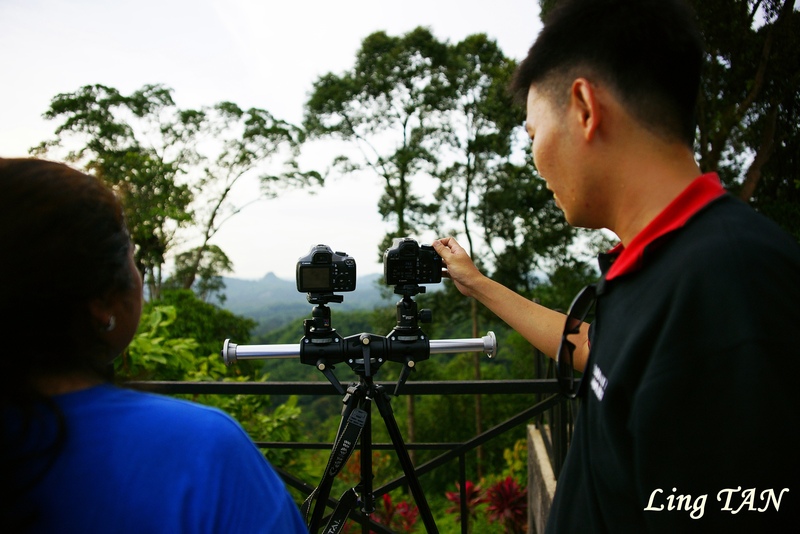 The EOS 1000D exposed the vegetations correctly but over exposed the sky and the mountain in the far end. As for the EOS 1100D, it under exposed the vegetations nearer to the camera but still acceptable on overall especially the mountain at the far end can be seen and the sky remains blue. Looking at both photos, the EOS1100D had an advantage over the predecessor and a safer bet too. So my take is, EOS1000D: 0/ EOS1100D:1. Test 3: View from the Mountain at Kuching, Sarawak, East Malaysia with lights from setting sun & slight haze. Both cameras set to 1/320, F9, ISO 200, FR 18mm, Evaluative Metering, AWB, Spot Focus on Centre AF, Manual Exposure. This is another excellent scene to test the camera. As the sky get darker, both the cameras are put through a comparative test again. The 2 photos above looks very much the same except for the vegetations on the lower left of the photo. The EOS 1100D had metered the vegetations correctly and the scene looks brighter. But it does not really matter as both camera had managed to captured what I had in mind. Looking at both photos, both cams are ok for this scene test. So my take is, EOS1000D: 1/ EOS1100D:1. Test 4: A church courtyard at the peak of a mountain at Kuching, Sarawak, East Malaysia with lights from setting sun. Both cameras set to 1/1000, F9, ISO 800, FR 18mm, Evaluative Metering, AWB, Spot Focus on Centre AF, Manual Exposure. I picked this scene because I want to see if both the cameras can “read” the scene correctly and how it reacts to a partial shaded and partial well lighted surrounding. From the photos above, both cams “reacted” in the same manner, but if you notice, the area near the top left (under the zinc roof) area, the EOS1100D has a better exposure as compared to the one shot with the EOS1000D while the rest of the photo from both camera looks largely the same. I can live with this slight difference, can you? My take will be , EOS1000D: 1/ EOS1100D:1. Test 5: A church at the peak of a mountain at Kuching, Sarawak, East Malaysia with back lights from setting sun. Both cameras set to 1/200, F10, ISO 400, FR 18mm, Evaluative Metering, AWB, Spot Focus on Centre AF, Manual Exposure. This is an interesting scene bacause the sun is setting from the back (right side) of the church building and the front of the church (scene as above) is getting darker by the minute. 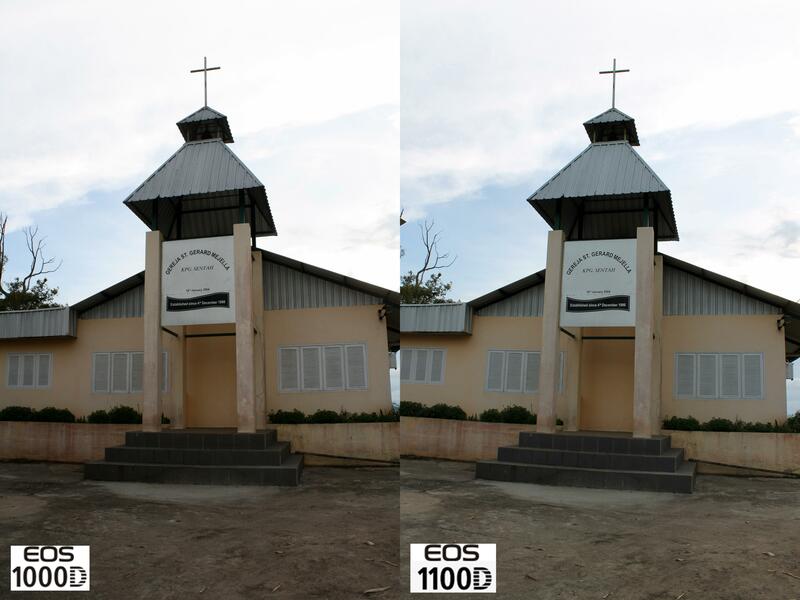 The result was surprising in this case because if you look at the the 2 smaller roof right below the Cross at the top, the under-side of these 2 small roofs, the shot by the EOS 1000D was able to accentuate the darker area in this scene but the the shot from the EOS1100D turned out slightly darker. 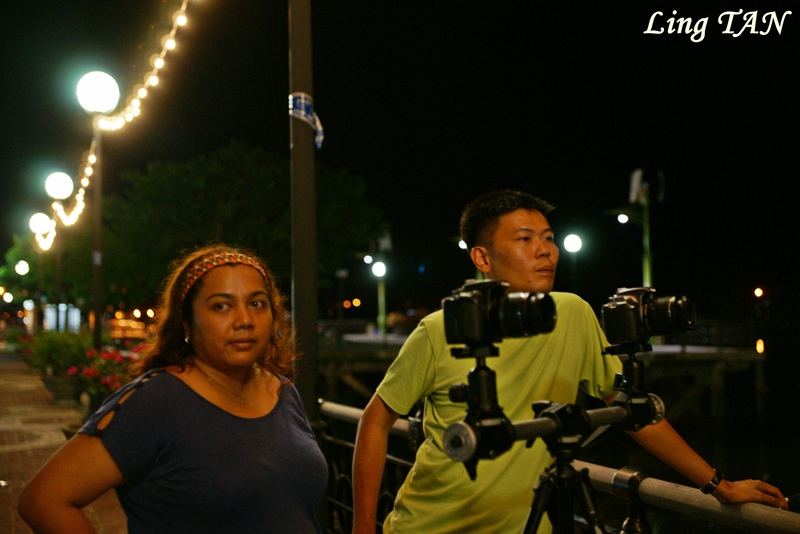 On the other hand, look at the foreground, the EOS1000D was not able to illuminate the scene as good as the EOS 1100D. So putting to commercial sense, what’s more important to me are the photo must look balanced and properly exposed while I can do away with neglegible details. So my take is EOS1000D: 0/ EOS1100D:1. Test 6: A flower the size of a 20 cents coin at a house garden at Kuching, Sarawak, East Malaysia with direct lights from a 10am sun. Both cameras set to 1/160, F9, ISO 400, FR 55mm, Evaluative Metering, AWB, Spot Focus on Centre AF, Manual Exposure + Flash. I went “Wow” when I saw both the photos, they both look sharp, nice color and so on. But when I blew up to 100%, guess what I saw? It is now apparent that the photo shot with the EOS1000D with the old kit lens has a limit when I comes to sharpness and magnification ration. Though spec-ed as equivalent with “mild” improvement, the EOS1100D with the new mark II kit lens out performs with its sharpness and details. Megapixel could be at play here as I only managed to magnify the EOS1000D photo to a limit so it looks slightly smaller above. Look at the centre of the flower. The new EOS1100D + new kit lens combo is the clear winner here. 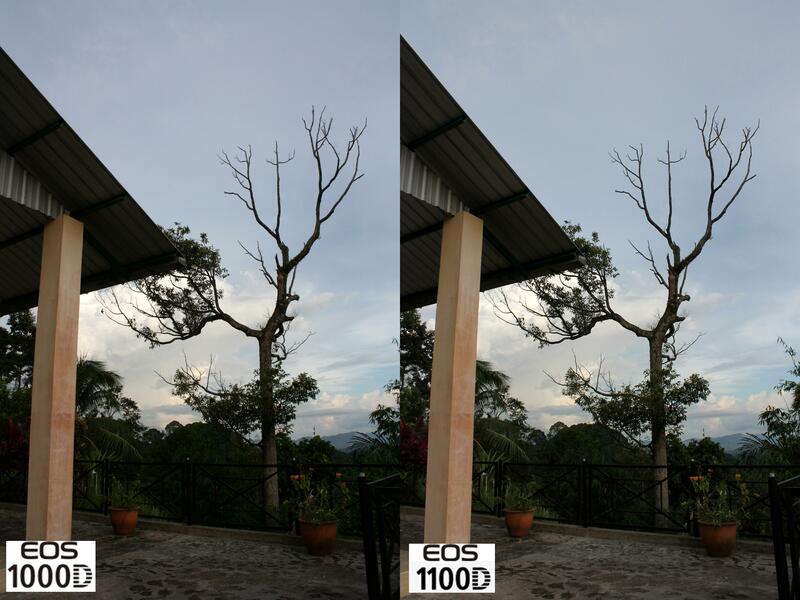 EOS1000D: 0/ EOS1100D:1. 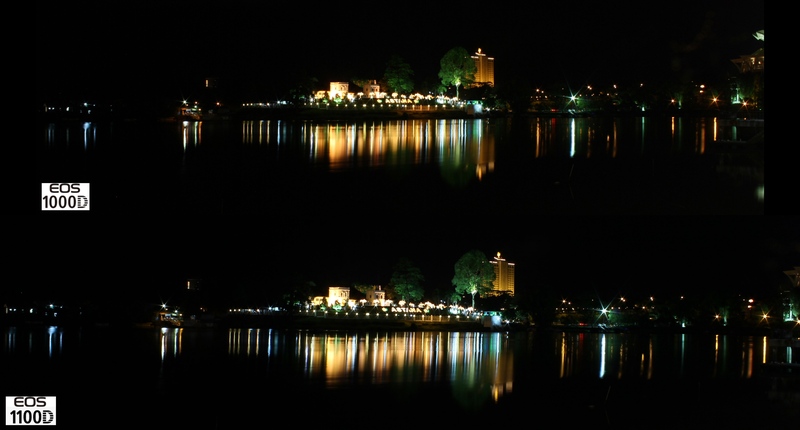 Test 7: Long exposure at night at a river park facing the Astana Palace at Kuching, Sarawak, East Malaysia. Both cameras set to 30 seconds, F18, ISO 100, FR 18mm, Evaluative Metering, AWB, Spot Focus on Centre AF, Manual Exposure. OK, both the photo looks the same right? Read on. I decided to zoom in. Both cameras set to 30 seconds, F18, ISO 100, FR 55mm, Evaluative Metering, AWB, Spot Focus on Centre AF, Manual Exposure. Still look the same at 55mm? OK, let’s blow things up a little. The cut section photo above shows a distinctive difference at 100% when both photos are magnified. 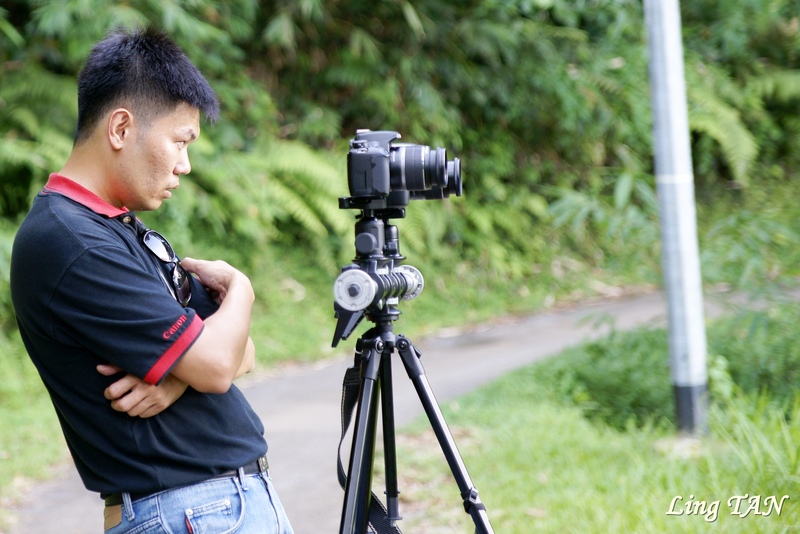 The EOS1000D combo is not as sharp as the EOS1100D combo. Noise is apparent for the EOS1000D shot, which I conveniently blamed the Digic III processor as opposed to the EOS 1100D’s Digic IV. New is better, it is very true here. 0:1. 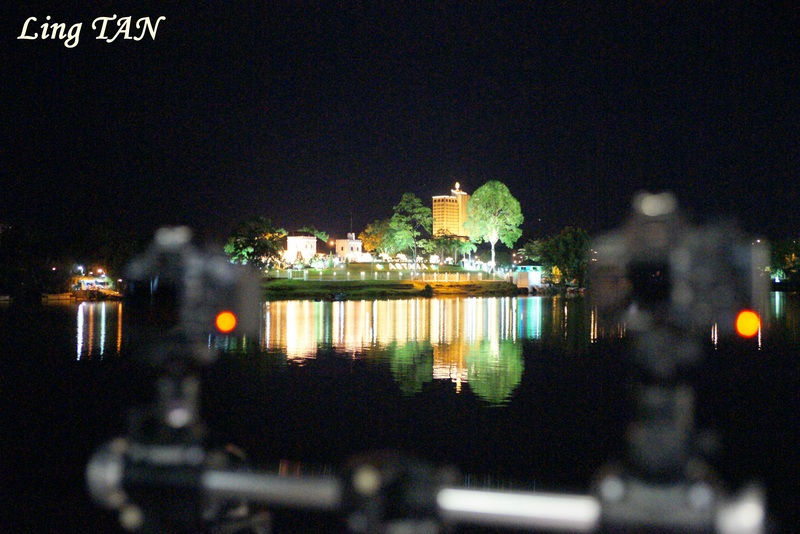 Test 8: Multi-Shot Burst at High speed at night by a river park facing the Astana Palace at Kuching, Sarawak, East Malaysia. Well you must be thinking why only 5 shots from the EOS1000D and 10 shots from the EOS1100D. Well, both cameras were actuated at the same time but the EOS1000D only managed to snap 5 shots while the EOS1100D shot 10, both camera started and ended at the same time. (Thanks Shela for lending your finger.) And out of the 5 shots from the EOS1000D, only 3 are sharp when viewed at 100% and the EOS1100D gave me 10 sharp photos. Oh Wow! The test shots above had the EOS1100D beating the EOS1000D 8:2. Let’s see how both cameras fared in other areas. 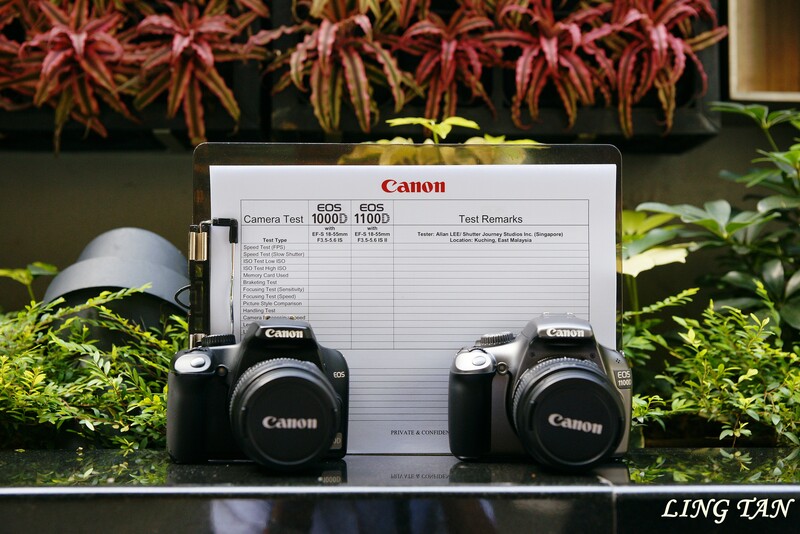 Based on the score sheet that I brought along to Kuching to test the cameras with my set of test criterias, the EOS 1000D scored 25/50 while the EOS 1100D scored an impressive 47/50. My personal view is, the EOS1100D is closer to the slightly “higher classed” XXXD series now. It feels good on my hand (which is more used to 1D-Series cameras) and it does not feels out of place. 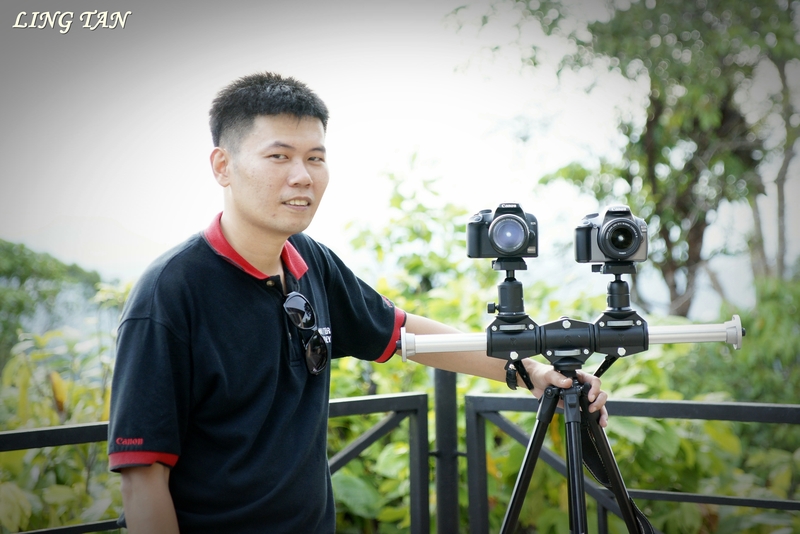 The finishing for the EOS1100D is of superb quality, the handgrip feels larger and purposeful and well sorted. So the EOS also scores on the ergonomic stats for this. With a little visual orientation of the dials and buttons, I can find all my familar icons and so EOS1100D is not a pain to use even for professional photographers who may wish to have a lighter casual camera when not on commercial jobs. The specs are built to lure and asking price is priced to sell. 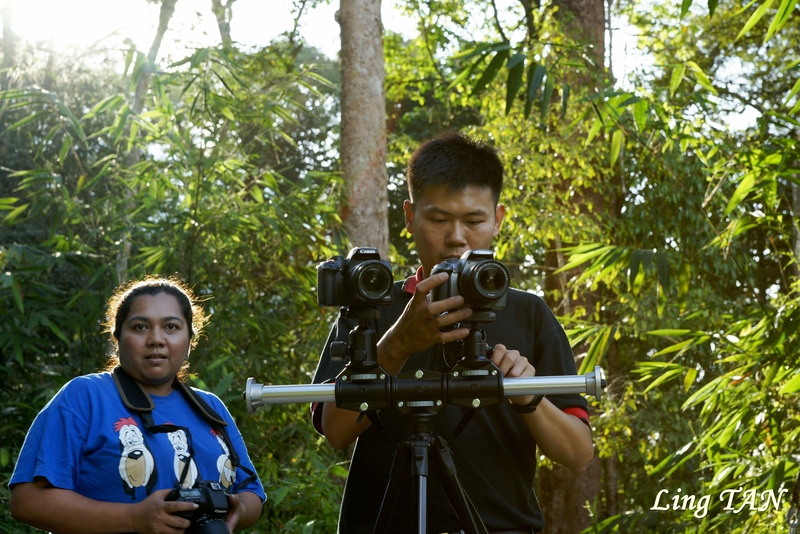 If you considering to move from prosumer compact to a DSLR camera, the EOS 1100D is an excellent choice – to start. This entry was posted in Brand: Canon, Group Test & Reviews, Photography Articles & Videos and tagged Canon, DSLR, EOS, Lens. Bookmark the permalink. Detail testing. I love it. Thanks Justin! Glad you enjoyed the article! Great in depth analysis and testing…….thank you so very much…. An excellent review, I am looking for a lighter travel camera (instead of luging the 50D everywhere) do you think the 1100D would be OK? I will gladly leave my 1D4 & 5D2 at home and just take the 1100D for travel. Excellent article, I have the EOS1000D would you think it would be worth upgrading considering the differences you used on here? It’s good article indeed. juts wanted to ask what would be the best compatible telephoto lens for 1100D. i am planing to buy one and confused between Sigma and canon 55-250mm. Between the 2, both offers distinctive values. If comparing between basic level telelphoto lenses, Sigma has a better built as compared to Canon’s EF-S units which is meant for mass market. 1) If Budget is a concern – EF 75-300mm F4-5.6 III USM. (This has 4 versions, get the right one). 3) If you are feeling lucky – EF 70-200mm F4L USM There are 4 other versions rangin from F4 IS, F2.8, F2.8 IS, F2.8 IS II. Most sites simply compare the specs. You’ve taken the trouble to take photos in various settings and presented them very clearly and legibly. Will come back to this site for my future photography dilemmas. I was comparing the two for digitization of our manuscript library. Based on your review it is clear that the 1100d is worth the little extra cash. 100,000 shutter actuation – but it varies from user to user. Thanks… any tips on how to do long exposures on 1100d? i still a bit scared of doing long exposures since when i tried i got either over exposed or dark images.. There are many materials on the net on how to do basic long exposures. You can research on that. However as a basic requirement, you need a remote switch, a good tripod (Heavy) and some filters like Neutral Density Filters. 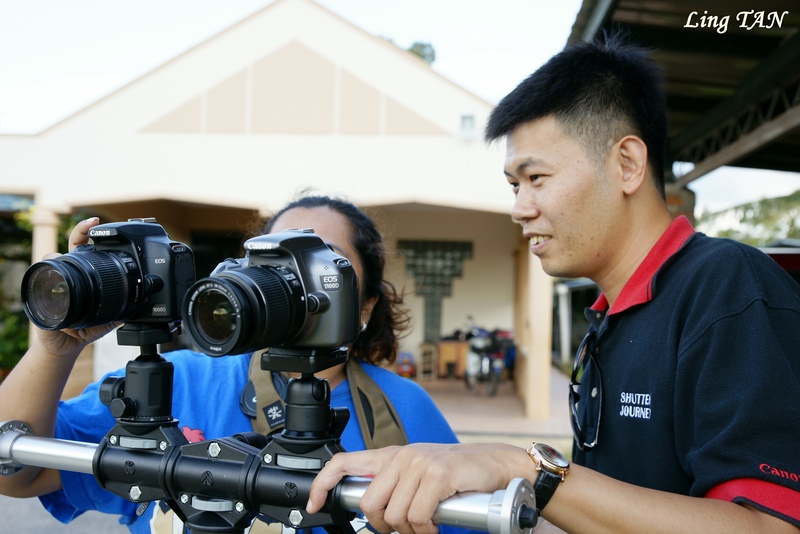 Get a Used DSLR to learn first. Lots of used ones on eBay. Thanks for doing this test. It’s very easy for a beginner like me to understand. Now I’ll know which DSLR to buy. Thanks again. Glad this helps in making your purchase decision. I am a beginner and your article leads me to a decision. I will finally buy my camera next week!! Thank you so much!!! 1100D FTW!! Do Join us for our events too. Do a search under the Event Tab. Just excellent Sir. Its so amazing to see the work you have done to compare both cameras so that I know which one suits an amateur pro photographer.